Pen-and-ink drawing of a carved wooden frieze from the palace at Shimoga by an unknown artist, 7 September 1805. This drawing, from the collection of Colin MacKenzie, is one of a series of sketches chiefly of architecture and sculpture in South India made between 1803 and 1808. The drawings are divided into roughly 5 groups, folios 1 to 51 depicting specimens of architecture mainly from Kolar, Sravana Belgola, Conjeeveram and Shimoga. Some drawings are by MacKenzie himself, others are by his assistant surveyors and draftsmen, including H. Hamilton and J. Newman. Shimoga is situated on the Tunga River in Karnataka. During the 17th century it was an important stronghold of the Nayakas. In 1763 it was taken by Haider Ali and was plundered by the Marathas in 1798. The town was occupied by the British in the early 19th century after the Maratha wars. Shimoga is now, an important industrial, commercial and educational centre. The Shivappa's Nayaka Palace, overlooking the Tunga River, is named after the 17th century Nayaka ruler but actually belongs to the time of Haider Ali in the second half of the eighteen century. The two-storeyed Durbar Hall, the hall of audience, has massive wooden columns connected by arched panels and chambers with balconies looking down into the Hall. 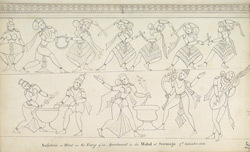 This drawing depicts some carved wooden friezes of dancers and musicians from the Palace's apartments.